Considering the Curcubit (squash/gourd) family, doesn't spaghetti squash deserve a break? A solid, sunny-faced jock drawn to drama, but always stuck playing a single role. Noodles. That's how idle stories tend to unfold in my imaginary talking vegetable world, anyway. Until recently. I can describe Spaghetti Squashman as 'poor' no longer...because, now I know about squash browns! The first day we discovered slow cooker whole spaghetti squash (THANK YOU, Sarah, for the beautiful home-grown squash assortment!!) we devoured it as noodles. But now that I know squash browns are just as easy, they'll likely be just as much a go-to, or more. We've already had them three days in a row (side at dinner, lunch, then breakfast) without feeling bored. 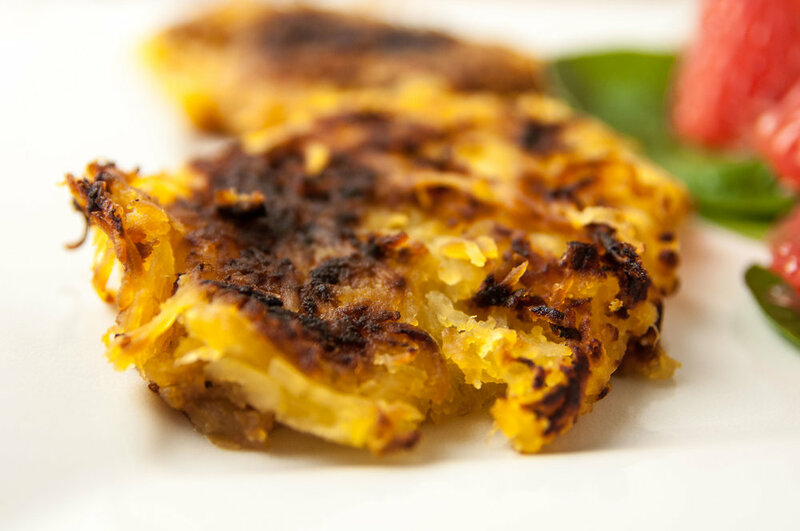 My gourmet friend Kristin has elevated squash browns to another level, incorporating egg and flour as you would with the original inspiration, so that's an option, too. Press excess water out of cooked spaghetti squash (using paper towels, tea towels, pushing through a strainer, or whatever method works for you). Heat oil in a large skillet (or coat with cooking spray) over medium-high heat. Form patties and place in hot pan. Sprinkle with a little salt and pepper or desired seasonings. Cook approximately 5-7 minutes per side, flipping once. Use a spatula to reshape an scrape up browned bits as needed.